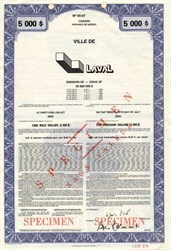 Beautifully engraved specimen certificate from the Ville De Laval printed in 1995. This historic document was printed by Yvon Boulanger and has an ornate border around it with a vignette of company title. This item has printed signatures by the City's Treasurer and Mayor and is over 10 years old. Early beginnings Established as a seigneury and granted to the Jesuits in 1636, �le J�sus was one of the first domanial institutions created by La Compagnie des Cent Associ�s (Company of the 100 associates) near Hochelaga. It was officially taken over in 1638, four years before Montr�al was founded; however, its development was by far slower than that of its neighbour. Agricultural operations only began there in 1670 under Fran�ois Berthelot, K.C. According to a report written by Jean Talon and dated March 13, 1673, there was a main manor there at the time and the crops for the two preceding years had produced 600 pecks of wheat. In his diary for the years 1672-1674, Father Dalmas, S.J., mentions the existence of a number of dwellings as well. The first land grants date back only to 1675, however, or soon after, under Mgr. Fran�ois-Xavier Montmorency de Laval, the first bishop of New France, who had acquired the seigneury and who later gave it to the Qu�bec Seminary. The census of 1681 indicates that four families were living on the east end of the island. By 1702, the growth of the population warranted the foundation of the first parish, which was dedicated to Saint-Fran�ois de Sales. As more settlers arrived, land development gradually continued westward, thereby creating the need for new parishes, which, in 1845, formed the boundaries for the first four civic municipalities. As a result, for two centuries, �le J�sus was exclusively used as farm land. At that time, there was only one built-up area, which became the village of Sainte-Rose in 1850, and remained the island�s main town until the end of the 19th century. From rural to urban life Urbanization of the island began slowly at the beginning of the twentieth century, with the founding of the city of Laval-des-Rapides (1912), and the village of l�Abord-�-Plouffe (1915). At that time, �le J�sus was mainly a tourist attraction and proved to be an ideal resort for Montrealers, thereby accounting for the founding of Laval-sur-le-Lac, at the western tip of the island, in 1915. The division of head parishes began about the same time, continuing through to 1960 and even accelerating during the following decade. This last period, which was marked by unprecedented prosperity, in fact coincided with a wave of metropolitan expansion that brought huge migration towards the suburbs, and particularly to �le J�sus. This sudden influx of population and the unbridled development it caused gave rise to problems common to all neighbouring municipalities subjected to excessively rapid growth: substantial investments, costly duplication of equipment; an increase in the number of administrative duties; disparity in the cost and quality of services; conurbation; conflicts between municipalities and a lack of resources. To solve this situation, some authorities proceeded with the first merger of municipalities, grouping the towns of l�Abord-�-Plouffe and Renaud and the city of Saint Martin and creating the city of Chomedey in 1961. This initial move stimulated a varied local development and proved to be financially profitable, but nevertheless inadequate to remedy the overall situation affecting all the other island municipalities. 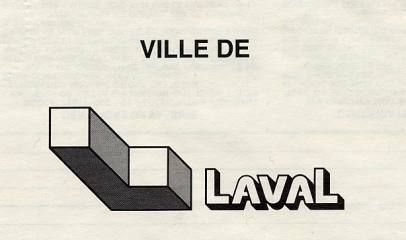 The birth of Laval Concerned with the problem, the Qu�bec department of municipal affairs set up an inquiry commission, on February 7, 1964, to examine the intermunicipal problems of the fourteen municipalities on the island. The commission, headed by Judge Armand Sylvestre, tabled its report in December of the same year and recommended a complete and total merger of the municipalities. The city of Laval was officially incorporated under the name of Ville de Laval, on August 6, 1965, under Chapter 89 of the Statutes of the Province of Qu�bec (1965), which has since been amended a number of times. The creation of the city of Laval merged the thirteen municipalities on �le J�sus as well as the municipality of �les-Laval into one big city. From the time of its creation, the city of Laval became the second largest city in the province of Qu�bec, after Montr�al, in view of its large population of over 170,000. Development of the city of Laval Originally, Laval was more of a bedroom community. Today, with a population of 350,000, the city of Laval has become a regional centre of economic activity equipped with a very strong commercial structure as well as a balanced and diversified industrial structure. And so, Laval�s economy is now in a position to provide nearly 105,000 jobs1. Although still young, Laval�s community has acquired all that is necessary for a dynamic city, such as industrial parks, shopping centres, a transit corporation, a CEGEP, a general hospital, filtration and purification plants, parks for recreation and relaxation, a network of libraries, a nature centre, an arts centre, a tourist bureau, a municipal housing bureau as well as an economic development organization. Since 1965, Laval has granted nearly $7 billion2 in building permits on its territory; its housing inventory has increased approximately 175%, while the assessment roll has been multiplied over 25 times. These figures bear witness to a very enviable economic vitality. History from Ville De Laval Website.